The charge sheet against Thatcher is endless but here are the worst of her crimes. Right To Buy – the current government is desperate to reduce the huge cost of housing benefit. They seek to blame this on workshy layabouts dozing in bed and expecting the state to pay their rent. The truth is that it is so high because the working poor cannot afford private sector rents; and they are renting in the private sector because the social housing stock can only support the most vulnerable; and the social housing stock is so low because it was sold off under Thatcher’s Right to Buy. Just like the staff at the Ritz who found her body, we are all mopping up after Thatcher. 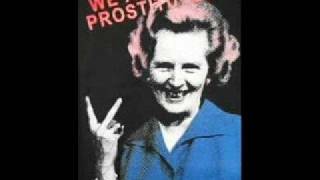 Privatisation – the fact that your water and electricity is supplied to you by some dodgy French company is down to Thatcher flogging off the utilities companies. And every year when your electricity goes up disproportionately and you get a hosepipe ban, it’s because the shareholders are lining their pockets with the profits instead of investing in the infrastructure. Falklands war – Thatcher was hugely unpopular in 1982 and would have certainly lost the next election. The Argentine invasion of the Falklands provided a great opportunity for her to position herself as a popular vote-winning Boudicca figure. All she had to do was send the boys down to the south Atlantic to duff up an inferior opponent. It all went to plan until HMS Sheffield got hit by an exocet missile. 255 British soldiers died in the conflict and 300 (and rising) veterans subsequently committed suicide (yes, that’s true). Blood on her hands – still. Miners' strike – Thatcher turned one group of public sector workers (the police) against another group of public sector workers (the miners). She mobilised the police as her own political militia to break a strike, destroy communities and divide a nation. She started today’s demonisation of the public sector by calling the miners “the enemy within”. Greed - Some people of my acquaintance are mourning Thatcher. They bought their council house at a huge discount, and flogged it for a massive profit as soon as they could; they bought shares in every utility flotation so they could make a quick profit; they kept a small amount of money in every building society so they would qualify for the 200 quid bung when it floated to become a bank. They were not alone; these were the sort of people Thatcher appealed to - selfish and without morality. Finally - Euripides said, “judge a man by the company he keeps”. Thatcher called Nelson Mandela a terrorist but regularly took tea with Chilean fascist dictator, General Pinochet.